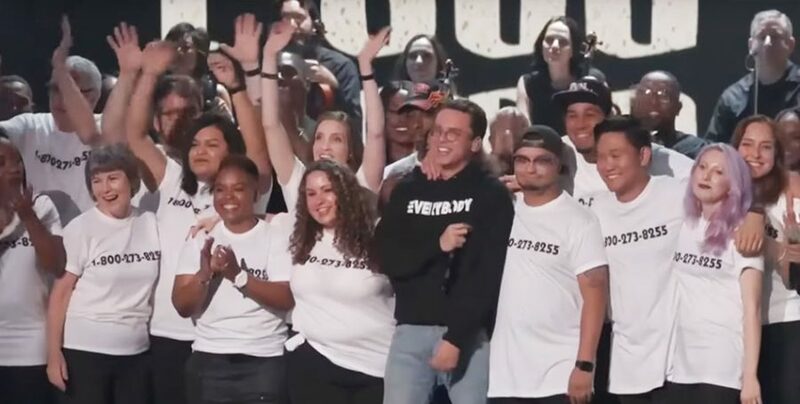 Fifty Didi Hirsch clients, staffers, volunteers and friends—most of whom have attempted or lost someone to suicide—joined rapper Logic onstage for a powerful performance of his suicide prevention song, “1-800-273-8255,” at the MTV Video Music Awards on Sun., Aug. 27. The emotional song, which brought many people on stage and in the audience to tears, is named after the National Suicide Prevention Lifeline—of which the Didi Hirsch’s Suicide Prevention Center is a leading member. On the day of the performance, our crisis counselors, who talk to people in English and Spanish from around the nation, answered a record 470 calls and chats, including nearly 100 on the Disaster Distress Helpline from people affected by Hurricane Harvey. Logic shared the stage with Didi Hirsch survivors—people who have attempted or lost a loved one to suicide—as a way to show how suicide affects people of all backgrounds, ages and ethnicities. Also performing on the song were Alessia Cara, Khalid and Jason McGee and The Choir.